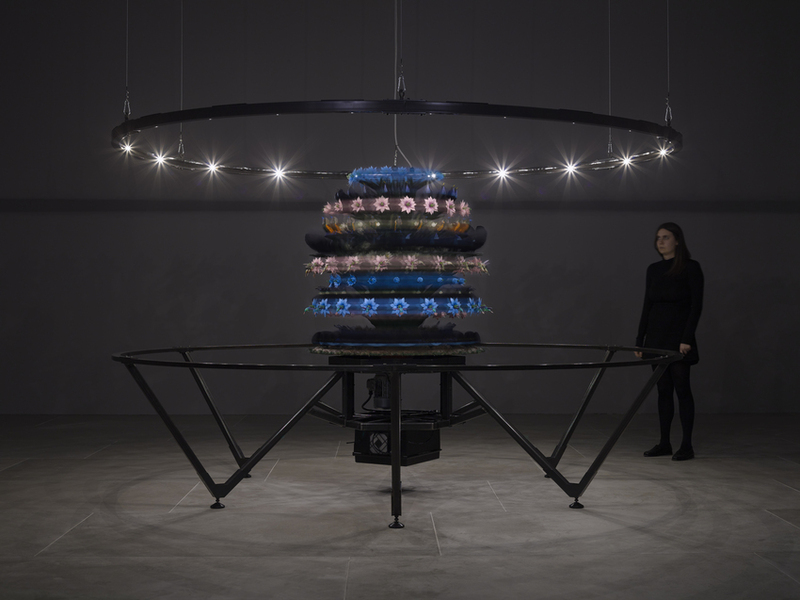 In The Centrifugal Soul, Mat Collishaw’s forthcoming exhibition at Blain|Southern, the artist presents new sculpture, installation and paintings. Drawing on various forms of illusion, the exhibition explores ideas of superficial truth and the erosive effect of our primal urges for visual supremacy. Collishaw worked with evolutionary psychologist Geoffrey Miller – whose theory is that the origins of art stem from natural instincts of courtship and reproduction – to produce the title work and centrepiece of the exhibition. The Centrifugal Soul is a sculpture in the form of a zoetrope, a pre-film animation device that produces the illusion of motion through rapid rotation and stroboscopic light. 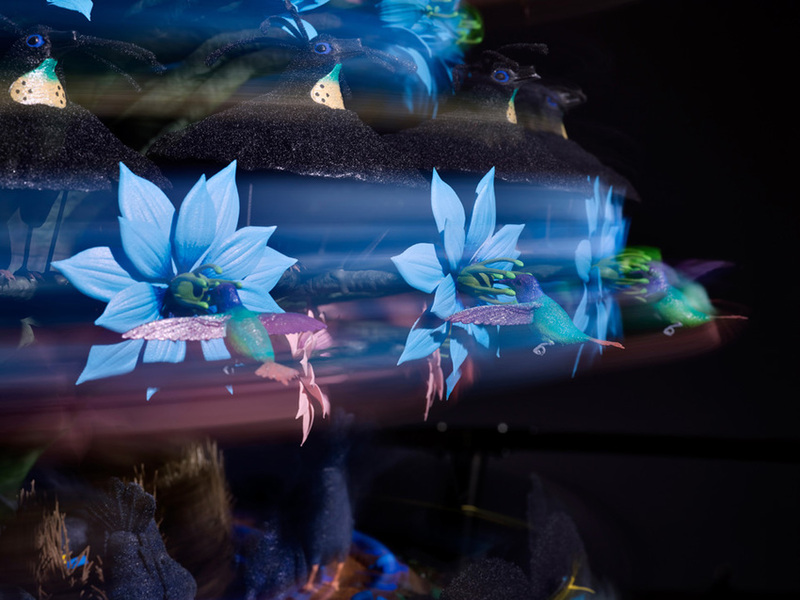 The zoetrope animates scenes of bowerbirds and birds of paradise as they perform elaborate mating rituals. The work offers a captivating demonstration of how aesthetic diversity has evolved through sexual selection and also reflects the artist’s ongoing examination of our insatiable appetite for visual stimulation. Collishaw’s sculpture embodies Miller’s idea that evolution has created an inescapable drive to be noticed above the visual competition, feeding our need for self-promotion. Elsewhere in the exhibition, a new body of work continues the examination of visual power play. Twelve trompe l’oeil paintings of British garden birds tethered to perches reference the seventeenth-century fashion for commissioning portraits of prestige pets, made popular through Carel Fabritius’ painting The Goldfinch (1654). The colourful graffiti-tagged walls against which the birds struggle to stand outprovide a contemporary example of aesthetic boasting as a form of sexual signalling. Albion is a new installation that takes as its subject the Major Oak in Sherwood Forest, Nottingham, which has an almost mythical status. This centuries-old tree has at its core a hollow rotten trunk, and since the Victorian era its vast limbs have been supported by an elaborate system of scaffolding. Collishaw’s monumental, slowly rotating image of the oak is a ghost-like apparition generated by laser scanning. The image represents a living object that is trapped in perpetuity to present the illusion of life. As with the tethered birds in Collishaw’s paintings, it presents a tension between the beautiful and the abject. The Centrifugal Soul will be accompanied by a detailed catalogue which features texts by art critic Waldemar Januszczak, evolutionary psychologist Geoffrey Miller and an artist interview with writer James Parry.